TLDR: This cake is for Sasha’s childhood friend’s boyfriend because he graduated from medical school. On to the second part. Coffee and chocolate cake! James is not picky by any means, but when you tell me “I like all cake,” I enter the realm of indecision frustration and cannot settle on anything. There are so many cakes out there in the world! So I got a hint: coffee cake. 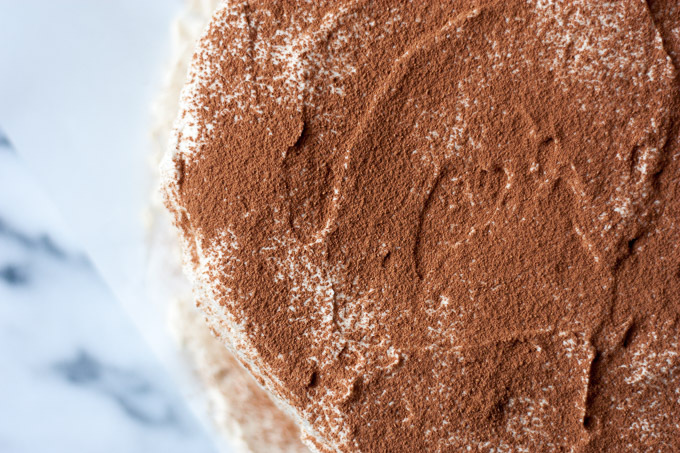 Thinking back on it, “coffee cake” could have meant the cinnamon crumble cake, which is often served with coffee, but I already decided on making a Mocha Cake & Espresso Whipped Cream layer cake. So James, if that was indeed what you wanted, oops. That can easily be arranged. 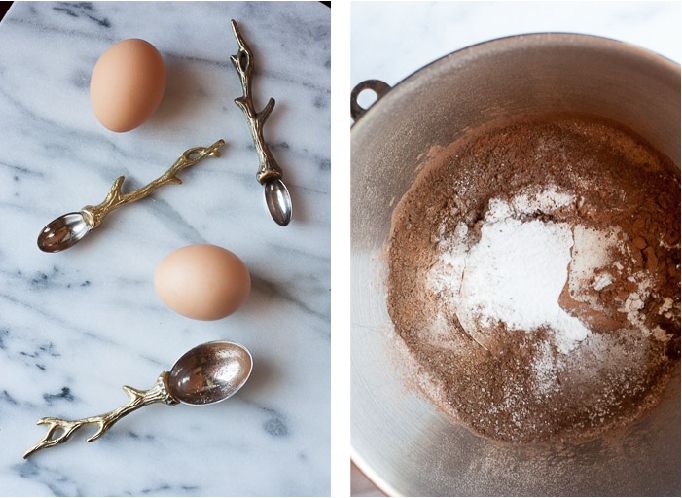 I went to my go-to chocolate cake recipe from the illustrious Ina Garten. Now say what you will about her penchant for inserting the “really good” modifier in front of all the ingredients in her recipes, unbelievably lush house in the Hamptons, and odd husband that only shows up for dinner, but that lady knows how to cook. To bump up the coffee flavor, I increased the amount of espresso powder, but the cake itself remains a mostly chocolate flavor. It bakes up moist and springy with a fine crumb. 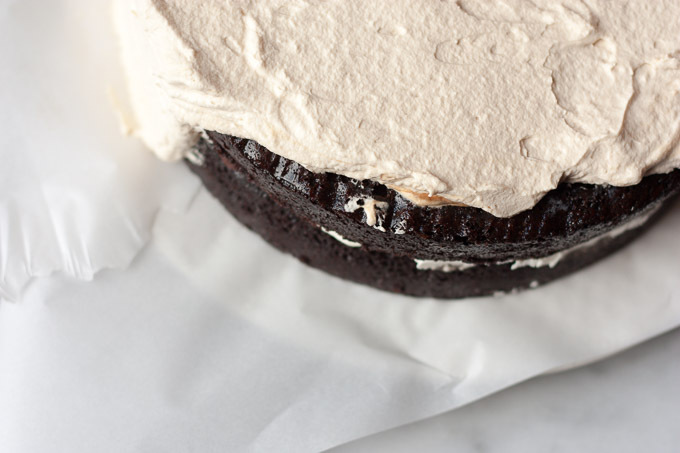 The frosting, which is actually a whipped cream, brings the most coffee flavor to the party. By mixing in a couple spoonfuls of espresso powder to the heavy cream, we get a tint of color and a burst of the coffee’s complex bitterness and richness. You can make the whipped cream as sweet as you like, but I like cake frostings to complement and not overpower the cake’s sweetness. I opted to use whipped cream over buttercream to keep the cake light and airy, not overly rich or dense. And for some reason, I think that whipped cream is better nutrition wise than buttercream. I know trying to choose a healthier option when making sweets is sometimes a moot point, but the lack of butter does make me feel better. By no means is this cake good for your physical health, but it did make James very happy. So interpret that as you will. 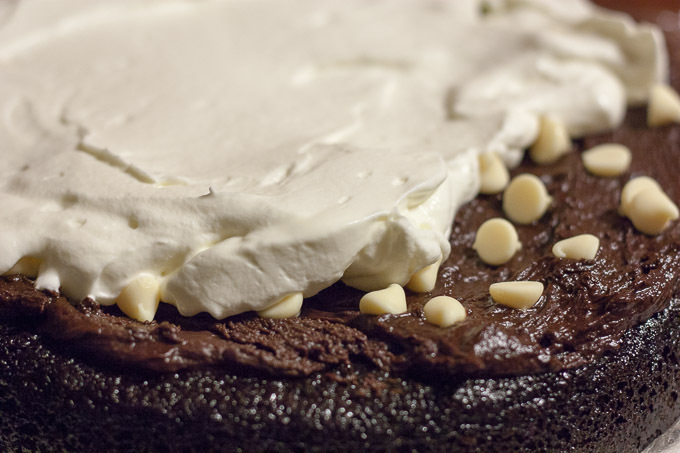 I filled the chocolate cake with chocolate ganache, whipped cream and some white chocolate chips for texture. Ideally, I would have chopped up chocolate covered espresso beans for some crunch, but I didn’t make it to the store in time for that to happen. You can omit any of these items, but I mean, who is going to object to more chocolate? I like to pop the cake back into the freezer or fridge after I fill it to ensure it stays put when I go to frost the outside. You can read more below on my layer cake making method. To top off such a luxurious Mocha Cake & Espresso Whipped Cream, I sifted on some cocoa powder. I thought about adding in some espresso powder as well, but getting an undissolved crystal of bitter espresso powder is quite unpleasant to say the least. 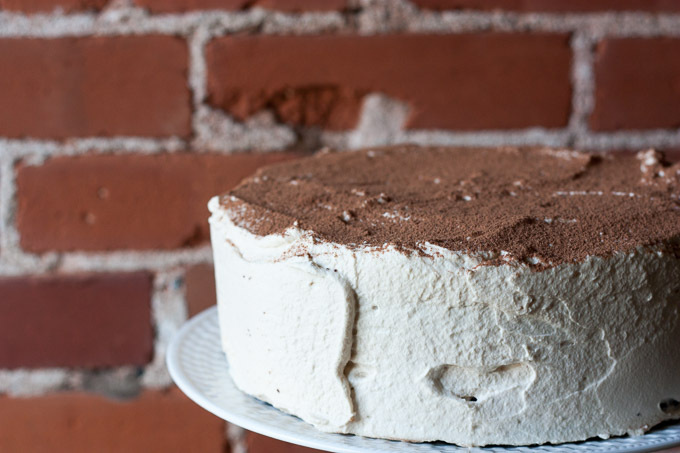 The cocoa gives some contrast to the light frosting as well as the look of tiramisu! The cake went over quite well, as you can see from what was left. The rest was cut up and deemed “emergency cake,” which is what we call the numerous leftover cake slices in our freezer. You never know when you’ll need cake! Finally, structural integrity. Not necessary to make tasty cakes, but it’s nice to have the cake look as good as it tastes! 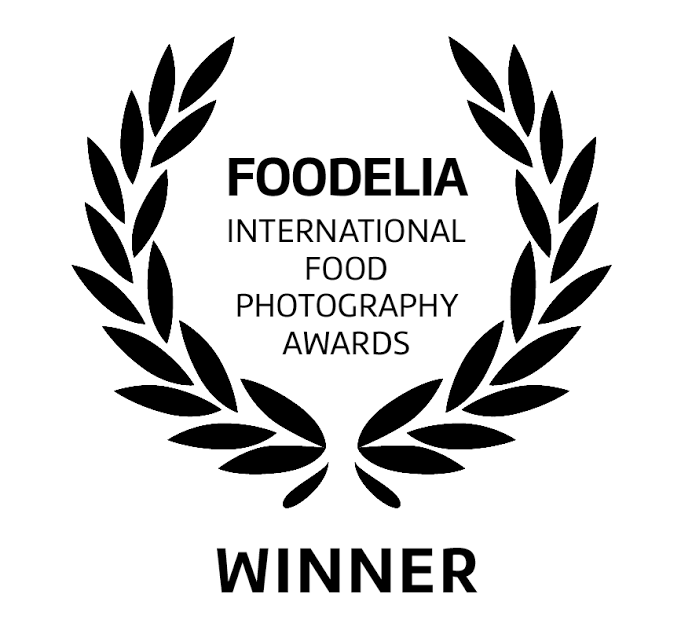 (And for bragging rights). I’ve only just become competent at making layer cakes. Many a cake has turned out lopsided, slipping and sliding, or just straight-up ugly. I haven’t taken classes on baking and building layer cakes, but there are some tricks I’ve picked up from watchingTV, YouTube or other bloggers. 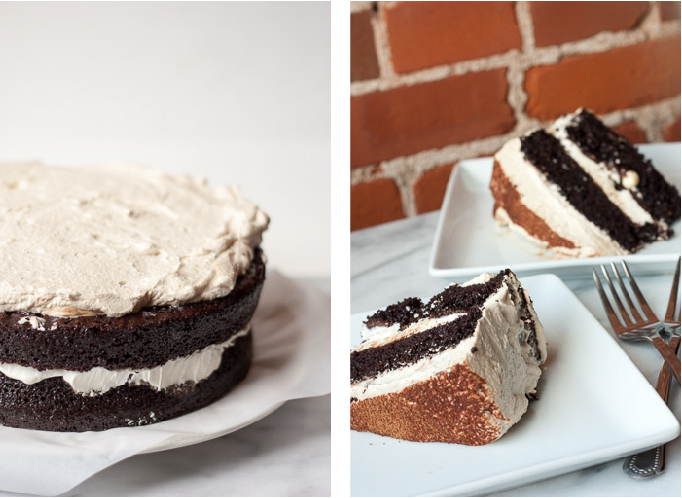 (Deb at Smitten Kitchen has a great post on her layer cake tips and tricks!). Now, I haven’t invested in too much speciality cake equipment either, so it’s likely you’ll be able to utilize these methods as a beginner baker without an Iron Chef Kitchen Stadium set up! You can buy these online or at a kitchen supply store easily for a couple bucks. Or if you’re cheap like me, just trace your pans on some parchment paper and cut them out. 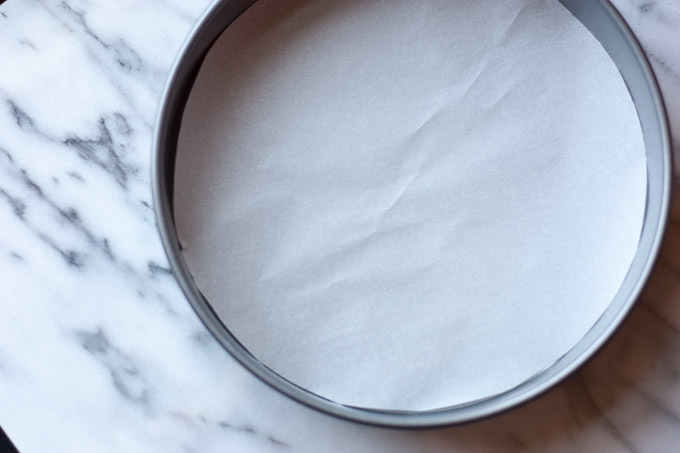 The parchment paper is an insurance policy to make sure your cakes come out cleanly when done. I still like to spray the pans down with coconut or canola oil. I prefer to use weight instead of volume when baking because it’s more precise and it’s easier to only have one bowl and forego all those measuring cups. Usually, I am not a stickler when it comes to such ingredient accuracy, but baking is a science and I don’t take chances. You can convert recipes by volume into weight with many online tools. I like to weigh my batter, subtract the weight of my stand mixer bowl, divide that by the number of layers I want, and then fill the pans with that amount of batter. Plan out your cake timeline. Let’s say the cake is for a dinner party on Friday and I’m not home until 6 pm every day. I will bake the layers early enough on Wednesday that they have time to cool to room temperature before I wrap them up for the freezer. I also leave the parchment paper on the bottom of the cakes until I stack them. On Thursday, I will make the inside filling and proceed to layer up the cake with filling and other goodies. At this point, I will also dirty ice the cake if needed. Again, I will wrap the whole thing up and stick it back in the freezer. On Friday, I make the frosting and frost the cake. The trick is to have a very solid and structurally sound cake before frosting. Once done frosting, I pop the cake into the fridge to set the icing a little. If I am transporting the cake, I leave it in the fridge until I leave the house. If the cake is to be consumed at my apartment, I take it out before guests arrive, giving it a chance to come to room temperature. Sometimes, baking pans, batter and oven temperature cause our cakes to bake into little domes. When you have a cake that is very high in the middle, it makes stacking them very difficult. A couple things you can try to combat this. Before baking, rap the pans on the counter and give it a little tilt-a-whirl action, whee! This rotation makes it so more batter sticks to the sides and bakes faster than the batter in the middle. Sometimes the batter doesn’t cling too well if you have generously sprayed down your pan. After baking, let the cakes cool and level them by cutting off the top with a long serrated knife. It’s difficult to cut level, but practice makes perfect. And who doesn’t like a little snack while baking? Move and flip the cakes around. Sometimes they aren’t consistent and some places are high and lower than others. By rotating and flipping the layers, you can find the most level stacking order. 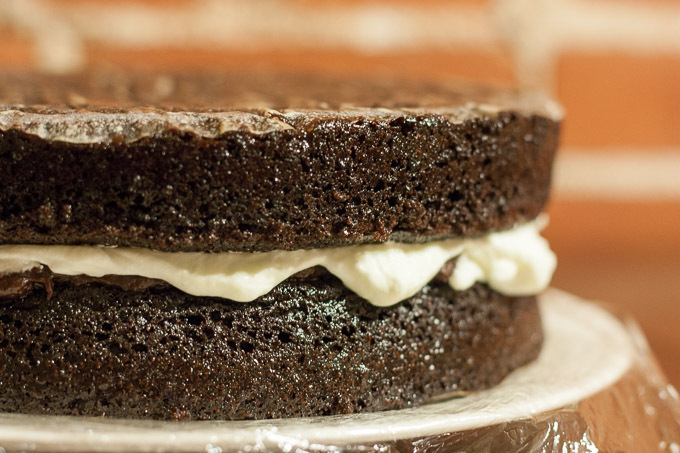 Before you start going to town with that frosting, put two sheets of parchment paper underneath your cake so they overlap a little, still covering whatever it is you are serving the cake on. This is so you can just pull each sheet out from underneath when done, leaving a clean surface. When you start frosting the cake, put a huge dollop in the middle of the top. Seriously. More than you think you’ll need. Once you spread the frosting out on the top, bring down some of that frosting down to do the sides. Go slowly and keep going around the edges until you’ve covered the whole cake. Then you can go back and even stuff out or make it pretty. 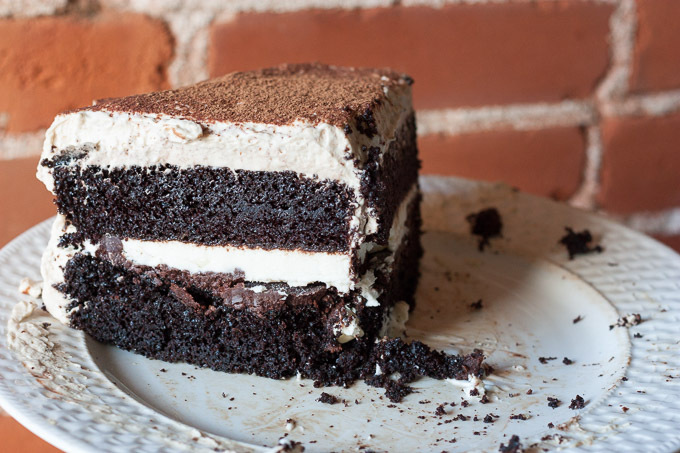 Got any more layer cake making tips and tricks? I’d love to hear them! There is so much more for me to learn. Share your thoughts below! 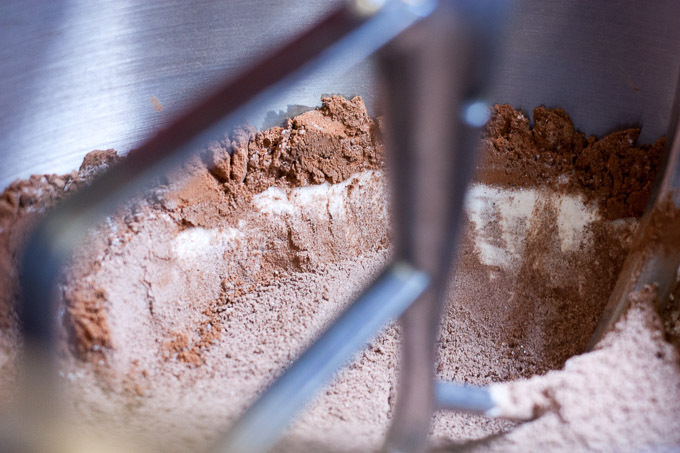 Sift the flour, sugar, cocoa, baking soda, baking powder, and salt into the bowl of an electric mixer fitted with a paddle attachment and mix on low speed until combined. 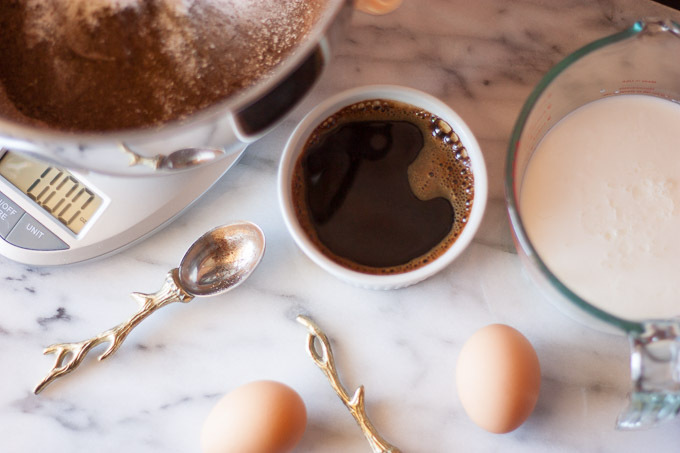 In another bowl, combine the buttermilk, oil, eggs, and vanilla. Once cakes have cooled, wrap each one tightly with plastic wrap, keeping the parchment paper rounds on. Freeze for a couple hours, or until they have solidified. 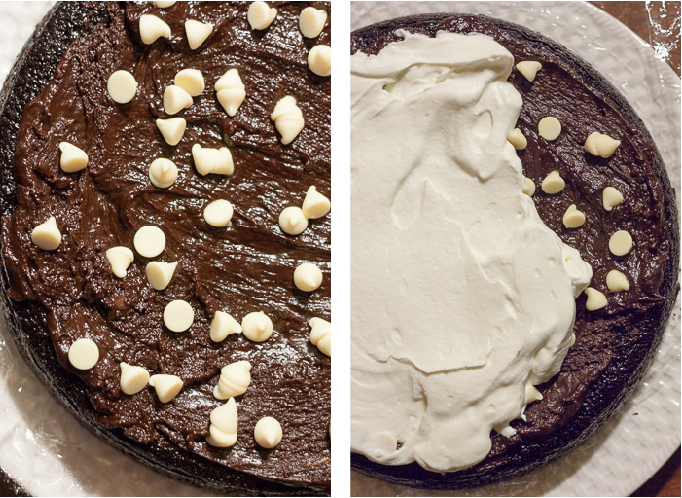 Unwrap cake rounds, fill the center with ganache, chocolate chips, and whipped cream. Tightly wrap up the cake and freeze until easy to handle. Place two sheets of slightly overlapping parchment paper underneath your cake and on top of whatever you are serving it on. This will help keep the surface clean when frosting. Frost the sides in sections, bringing frosting down from the edges of the top. Try to cover the cake first as we will even it out later. Even out the frosting by using a straight edge and turning the cake stand or create whatever pattern you like. Remove the parchment paper when done. 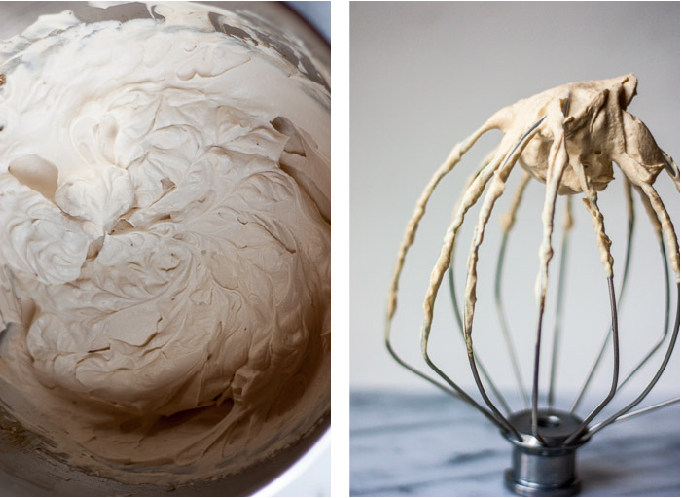 oh thank god for this post, i’m terrible at frosting things and there’s a lot of tips in here i never knew about. looks amazing sasha!!! Thanks Jessie! 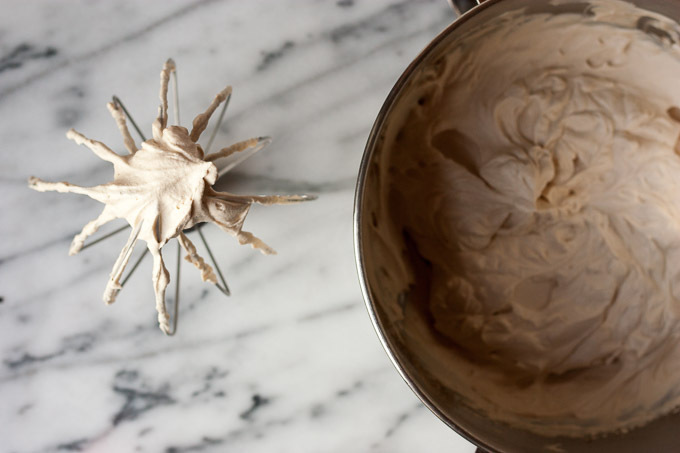 Yeah, frosting can be super frustrating, so just take some time to practice. At the end of the day, it’s just butter and powdered sugar so don’t worry about wasting some in your quest for pretty frosting patterns. If you really want to be intense, you can practice piping patterns on a countertop or parchment paper. Just scrape it off and put it back in the bag for another round!